Cleveland's tourism industry has grown dramatically in recent years and the city is now a major tourist destination. Standing in the state of Ohio and along Lake Erie's shores, the beautiful waterfront of Cleveland has been revamped and modern new buildings now adorn the skyline, including the stunning Rock and Roll Hall of Fame, now one of the city's most visited attractions. Featuring superb museums, spacious shopping malls and impressive sports stadiums, Cleveland is successfully competing with many of America's larger cities for its slice of the healthy tourism market. The Public Square in central Cleveland has become the heart of the city and is dominated by the historic Terminal Tower. Other important tourist areas in the city include the downtown district, Coventry, the University Circle (surrounding the Case Western Reserve University), the Historic Warehouse, Little Italy, Lorain Avenue, Ohio City and Tremont. Hotels are widespread in this part of Ohio and many affordable accommodation options are available here, particularly in the city center. Further Cleveland hotels can be found along East 12th Street, Euclid Avenue, Huron Road, Prospect Avenue and St. Clair Avenue. A selection of hotels is also situated close to the Cleveland Hopkins International Airport (CLE), which is around 10 miles / 16 km to the southwest. For the cheapest accommodation, it will be necessary for you to stay outside of the city environs, and the nearby Cuyahoga Valley National Recreational Area has a number of popular options, lying to the south. More information about Cleveland Hotels. 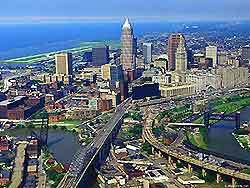 Tourism has become a thriving economy in Cleveland and the city contains several useful tourist information outlets. 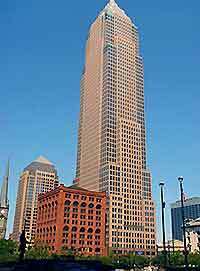 These include the Star Plaza at Euclid Avenue, and an office on the first floor of the Terminal Tower at Public Square, next to the Marriott Downtown at Key Center Hotel. Cleveland features many tourist attractions, including the Metroparks Zoo - boasting North America's largest collection of primate species, a rainforest exhibit and an aquarium building; the Great Lakes Science Center - boasting over 400 interactive exhibits, an OMNIMAX theater and around 4,000 educational demonstrations each year; the NASA John H. Glenn Research Center - offering interactive exhibits and information about NASA's aerospace programs; the Public Square - a popular central meeting point in Cleveland city; the Terminal Tower - an especially notable landmark dating back to the 1930s; and the USS Cod Submarine Memorial - a WWII submarine, docked on Lake Erie, within the downtown district. Other tourist attractions in Cleveland include Rockefeller Park - a vast park, containing 24 gardens and the impressive City of Cleveland Greenhouse; the West Side Market - a busy and historic market housed in a magnificent Neo-Classical building, the Cleveland Botanical Gardens - featuring award-winning display gardens, greenhouses and many collections of exotic plants; the Lakefront State Park - providing an important recreational area in the heart of the city, along the shoreline of Lake Erie; and Euclid Beach - dominated by an iconic stone archway and observation pier. 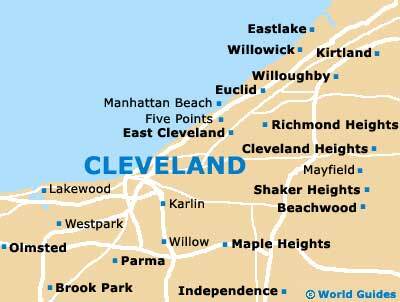 More information about Cleveland Tourist Attractions and Cleveland Landmarks. Cleveland also contains a number of dependable museums, with favourites including the Rock and Roll Hall of Fame and Museum - housing important rock music artifacts; the Police Museum - full of historic information about city's police force; the Cleveland Museum of Natural History - featuring more than four-million specimens, zoological exhibits and a planetarium; the Women's Air and Space Museum - celebrating the history of women in both aviation and space; the Cleveland Museum of Art - a world-famous art gallery containing a permanent collection of Renaissance paintings; and the African American Museum - founded to preserve information relating to artistic contributions by individuals with African origins. 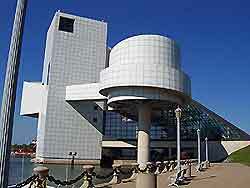 More information about Cleveland Museums and Cleveland Art Galleries. Tourist attractions situated near to Cleveland include the African Safari Wildlife Park - a vast drive-through reserve featuring hundreds of rare and endangered animals from all over the world; the Cedar Point Amusement Park - an award-winning amusement park within each reach of Cleveland, with fast rides, thrilling roller coasters and a tropical water park; the Dover Lake Waterpark - one of Ohio's largest water theme activity parks in the scenic Cuyahoga Valley National Park; and the Geauga Lake and Wildwater Kingdom - with more than 50 rides, water slides and a fun wave pool. More information about Cleveland Attractions Nearby.